SEVERAL months ago we saw comments about the European Patent Office (EPO) conducting job interviews for jobs that do not exist because of a longterm hiring freeze intended to reduce the number of patent examiners. Years prior to that Team UPC was advertising jobs that did not exist, as we repeatedly pointed out in past years (e.g. [1, 2]). “Robert Burrows is now promoting this illusion that UPC is about to start and the only decision left to be made is what people will wear.”I am not a lawyer, but I believe faking news might not be a crime, whereas faking job openings might be. There’s accountability and the advertiser can be sued. About 3 years ago Team UPC at IP Kat was pretending that a venue had been chosen for the UPC (in the UK) and that the court’s operations were imminent. Basically, they were choosing venues/courts even before a Brexit referendum (months earlier than that); there were psychological games and publicity stunts — ones whose nature was thankfully documented (I had been writing about the UPC and its predecessors for about a decade). 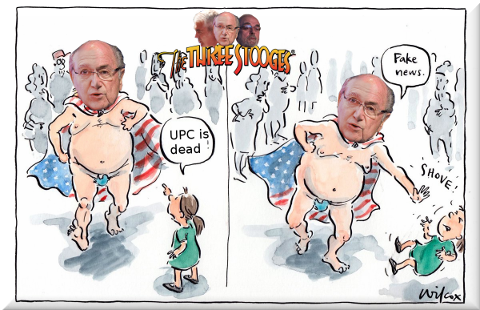 Months ago Team UPC spread fabricated rumours, trying to induce pressure on the FCC (German Constitutional Court). The patent attorney organisation, EPLIT (European Patent Litigators Association), has posted here a short survey asking members whether representatives before the Unified Patent Court (UPC) should wear uniform robes (and the reason for the answer) and, if so, what colour.